Worcester flanker Dewald Potgieter has signed a new undisclosed-length contract with the Premiership club. 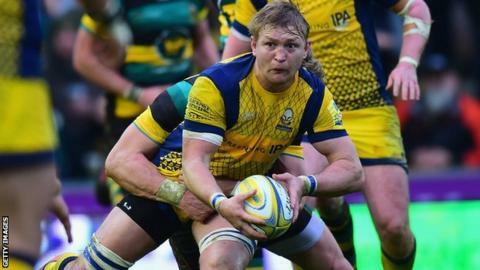 The 30-year-old South Africa international, initially signed by former director of rugby Dean Ryan in February 2016, will remain at Sixways for at least another season. "Dewald holds himself with the utmost professionalism," said Warriors director of rugby Gary Gold. "He continues to be a senior figure both on and off the pitch." After being signed from Japanese side Yamaha Jubilo, Potgieter made four Premiership appearances before suffering a shoulder injury in Warriors' key away win at Newcastle in March 2016 - a game in which he scored his first try for Worcester. He was then ruled out for a further three months in August after tearing his left thigh in pre-season training. He follows the recent lead of fellow South African Wynand Oliver, captain Donncha O'Callaghan, Scotland stand-off Tom Heathcote, Samoa flanker Alafoti Faosiliva and young forward Huw Taylor in opting to remain at Worcester.